Figure 36: Turbo Architecture Uses the National ITS Architecture. Turbo Architecture is a powerful tool for creating, maintaining, and using regional and project ITS Architectures. Turbo Architecture supports many of the requirements defined in FHWA's 23 CFR 940 Rule and the equivalent FTA Policy. This Rule/Policy requires ITS projects funded through the Highway Trust Fund to conform to the National ITS Architecture and applicable standards. Turbo Architecture uses the National ITS Architecture as a template that can be customized and tailored for your region or project. 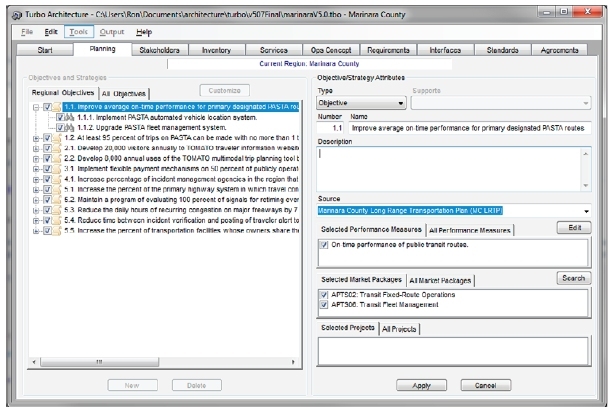 For example, Turbo allows you to define the interface between specific traffic and transit operations centers in your state or metropolitan area based on the general interface defined in the National ITS Architecture. The Turbo Architecture user interface is built around a series of tabs that guide you through the process of defining an architecture. For example, the Planning Tab shown in Figure 37 is used to establish the linkages between the architecture and the planning process that are described in this primer. 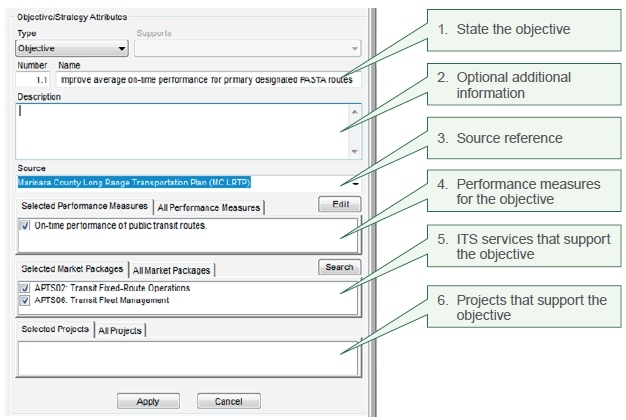 As you define an architecture in Turbo, you progress from left to right across each of the tabs to identify the objectives and strategies, involved stakeholders, inventory of existing and planned systems, services, roles and responsibilities, functional requirements, interfaces, standards, and agreements that apply to the architecture. Turbo also helps you establish the connections between each of these components. For example, you define the stakeholders that own and operate each part of the inventory and the ITS services that support each transportation objective. The same basic process can be used whether you are defining the overall architecture for a state or metropolitan area or a specific architecture for a particular project. In either case, you will have defined all of the key components of an ITS architecture by the time you reach the right-most tab in the Turbo interface. Turbo Architecture can also be used to quickly access and create a variety of outputs for an architecture. Many outputs are available for display, print, or publication as web pages, diagrams, Microsoft Word documents, and Microsoft Excel worksheets. Turbo is a Windows-compatible application that uses a standard Microsoft Access database to store the architecture content, providing another option for integration with other applications. Figure 39: A Closer Look at the Right Side of the Planning Tab. 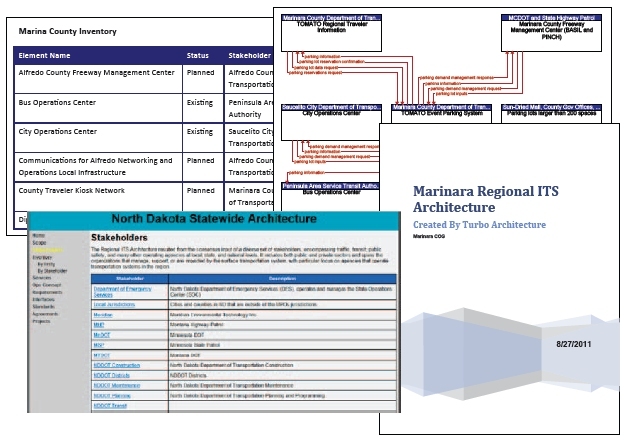 Turbo Architecture Version 5.0 was expanded to include a Planning Tab that provides an explicit connection between the regional ITS architecture and the transportation planning process. By using the new Planning Tab, you can better align the architecture with the region's transportation planning process. In turn, the Planning Tab can provide improved traceability between plan objectives, performance measures, M&O strategies, and ITS. The tab is configurable to provide links to any output of the planning process – goals, policies, objectives, strategies, or any other output from your regional planning process can be included on the Planning Tab. By default, the Planning Tab specifically supports the objectives and M&O strategies associated with the objectives-driven, performance-based approach to planning for operations. Figure 39 shows a close-up on the right-side of the Planning Tab as a user enters an operations objective. Every M&O objective can be entered into the tab along with a reference to the source transportation plan. The defined objectives may then be associated with service packages like Transit Fixed-Route Operations and Transit Fleet Management. Creating these linkages provides a cross-check that can aid both the objectives-driven, performance-based approach and the regional ITS architecture. Reports identifying potential disconnects may reveal objectives that are not associated with service packages and service packages that are not associated with objectives, suggesting that either the service package is not needed to support operational objectives or that an operations objective is missing from the list. Performance measures developed through the objectives-driven, performance based approach can also be associated with the regional ITS architecture. The Planning Tab allows performance measures to be defined and associated with operations objectives, M&O strategies, and service packages. Linking performance measures to the architecture in this way allows the performance measures to be consistently defined across the region and associated with relevant service packages in a systematic way. This enables differences in performance measures to be reconciled to establish a uniform system for performance monitoring and evaluation. Using the Planning Tab, specific objectives and/or strategies can also be linked to individual programs and projects, providing an explicit connection between projects and the earlier steps in the objectives-driven, performance-based approach. The Windows-compatible Turbo Architecture software is sponsored by U.S. DOT and is available for free download. The software includes a user manual, a quick-start guide, and other documentation to help you get started with the tool. Visit the Turbo Architecture Support Page (http://www.iteris.com/itsarch/html/turbo/turbomain.htm) for more information.